When he logs on, he likes rummage around on the marketplace or in-world, in order to find inspiring ideas which would help him create his stories. Second Life is an endless universe to him that has no limit but imagination. 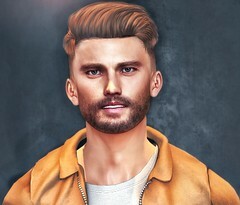 He likes thinking you only have to be creative so you never get bored on Second Life. I don’t think Second Life has changed me as a person. I’d rather say that it brought a lot of good things in my life. It helped me develop ideas I would never have imagined in real life. I’ve always been a creative person. I used to draw, I used to write and I even saw myself interested in drama. But I never looked for any professional way to perform any of that and I finally never had the chance to make all these harebrained ideas I had when going to bed, something real. If I had to remember one essential thing while studying drama is that drama is life, but life is also a play. That’s how I see every daily little things of life. It can be in streets, in trains. Any thing you see can be a source of inspiration and even creates scatterbrained stories sometimes (laughs). Second Life has this ability to make you travel and marvel. I love visiting when I have some time to spend. Now, if I had to mention three sources of inspiration for my stories, I would start with the magnificent city of Miss Eripom Moonwall « SSOC ». Then, it would go on with « The Outbreak », which is probably one of the most beautiful sim based on the post-apocalyptic theme which clearly reminds me of the The Walking Dead. And finally the Hive – Resident Evil RP Sim by the talented Andy Harper. If I really had to answer the question « How has Second Life changed you as person? », I would say that Second Life made me come out of my shell. It gave me a voice, a way to express myself through my stories. A lot of people see Second Life as a dating site (Well, everyone is free to see things the way they want) but to me, it’s way more than that. It’s a platform to infinite creation where everything is possible. It gathers people, ideas and it’s a way for anybody to feel better in life. Second Life has this thing to make you feel good and fulfilled. And that’s how I will always see it as.